In UPilot CRM, you can easily create a deal and can trace each stage of the deal in the pipeline. However, if you want to remove the deal from the list instead of marking it as lost you can directly delete it as well. Open the deal which you want to delete. Click on the ‘Delete deal’ option. Click ‘Delete’ on the confirmation message to delete the deal. Deleting a deal is a permanent action and cannot be reversed. Your selected deal is now deleted from your account. 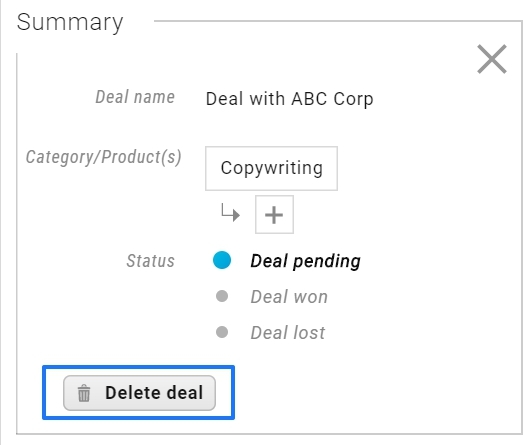 In UPilot, you can also delete multiple records in a single click from the needed section (For example: Deals section > Select multiple deals by clicking on the checkbox on the left of the deals from the list > Click on ‘Delete’ icon above the list > Confirm Delete by click on ‘Delete’).